Clarkson PLC today announces preliminary results for the 12 months ended 31 December 2017. “I am pleased to report another year of strong growth as we have consolidated our market-leading position and continue to innovate and expand our offering to keep Clarksons at the forefront of the shipping industry. Clarksons uses APMs as key financial indicators to assess the underlying performance of the Group. Management considers the APMs used by the Group to better reflect business performance and provide useful information. Our APMs include underlying profit before taxation and underlying earnings per share. An explanation of the term ‘underlying’ and related calculations are included within the financial review. This year the shipping market has displayed some early signs of a recovery following a sustained period of challenging trading conditions for the industry. Despite ongoing headwinds in certain sectors, the strengthening of the broader global economy during 2017 has boosted the shipping market, highlighted within dry cargo where the Baltic Dry Index ended the year 42% higher than it started. Whilst we remain cautious about the near-term direction of the industry, we are pleased to report that Clarksons has once again delivered a confident performance on the back of this wider macro-economic improvement and continues to deliver substantial value to our shareholders. Improvements across a number of divisions over the past year have been particularly pleasing, notably in the dry cargo freight market and container sector, as well as the strong performance in investment banking and project finance. Against this backdrop, we have consolidated our position as market leader, increasing our market activity through a mixture of innovation, investment and a continued commitment to providing a ‘best in class’ offering. We have made significant investments in technology over the past 12 months, ensuring that Clarksons not only remains at the forefront of the shipping industry, but continues to innovate and develop new services for our clients. Our position at the heart of the shipping industry has been built over 166 years, based on a fundamental dedication to our clients, and providing them with a unique, tailored service that offers an unrivalled understanding of the sector. As market leaders, we have an opportunity to set new benchmarks for best practice in the sector and to create and shape the next generation of broking, banking, market analysis and technology. This has been a key area of focus for Clarksons in 2017 and we are very pleased with the progress we have made during the year. Clarksons continues to pioneer new ways of doing business in the shipping industry and is well positioned to capitalise on this investment in 2018 and beyond. Underlying profit before taxation was £50.2m (2016: £44.8m). Reported profit before taxation was £45.4m (2016: £47.3m).Underlying earnings per share was 116.8p (2016: 105.2p). Reported earnings per share was 104.4p (2016: 119.7p). As explained in the financial review, free cash resources at 31 December 2017 were £54.1m (2016: £47.3m). Clarksons has maintained its impressive dividend record this year, having increased it every year since 2002. In line with this progressive dividend policy, the Board is recommending a final dividend of 50p (2016: 43p). Coupled with the interim dividend of 23p (2016: 22p), the resulting full year dividend is up 12% to 73p (2016: 65p), making it the 15th consecutive year of dividend growth. The dividend will be payable on 1 June 2018 to shareholders on the register at 18 May 2018, subject to shareholder approval. Clarksons remains a highly cash-generative business and, following the repayment of the outstanding loan notes during 2017, is now debt-free with a strong balance sheet. The current state of our markets means that there are a number of exciting opportunities for growth and the creation of shareholder value, which remains our primary goal. The Board intends to capitalise on these opportunities as a priority, whilst continuing to hold firm to our progressive dividend policy. Our colleagues and their hard work and expertise are at the centre of Clarksons’ continued success, and underpin our commitment to providing a ‘best in class’ global offering. We have continued to invest in and develop talent throughout 2017, as seen by the opening of new offices in Tokyo and Seoul, the hiring of a number of key individuals globally across many business lines and the extension of banking activities into convertible bonds and broking activities into wet FFAs. We take our position as the leading sector employer very seriously, and are committed to continually setting new industry benchmarks of excellence. I would like to thank all our colleagues for their hard work and dedication in 2017. Peter Backhouse, Senior Independent Director, and I have been interviewing prospective successors for Ed Warner on the Board and as Chair of the remuneration committee, and expect to be able to announce a new appointment to the Board this year. When a suitable candidate is found, Ed will retire from the Board and as Chair of the remuneration committee, having served nine years as an independent Non-Executive Director. I am pleased to report another strong performance from Clarksons in 2017 as the business achieved revenue of £324.0m, representing growth of 6%. Through our commitment to differentiate our offering by innovating and constantly developing our capabilities, we have reinforced our position at the forefront of the shipping industry and delivered another year of profitable growth, resulting in a 15th consecutive year of dividend growth for our shareholders. 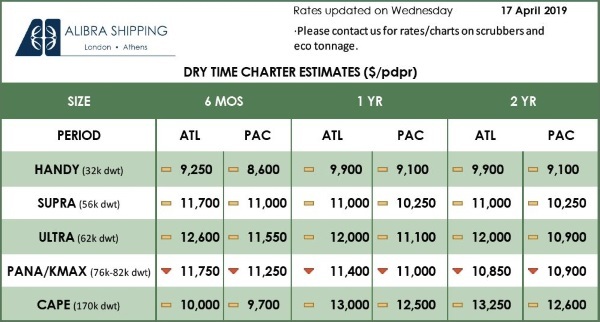 The continued overall recalibration of the shipping markets is a positive sign to the markets. However, movement in sectoral demand/supply balances have once again shown how reactive the individual markets are to such balances. The rising cost of steel and currency movements have led to the continued slowing of fleet growth through lower levels of newbuildings. This, together with reasonable levels of end of life recycling enabled by high scrap steel prices, are key factors in changing the demand/supply imbalance, which in turn supports an improvement in rates and asset values in a number of sectors. The sector showing most improvement was the dry cargo market, evidenced by the strong recovery in the Baltic Dry Index, although some of these gains were tempered by other sectors such as deep sea tankers and LPG which saw continued deliveries into already fully supplied markets. 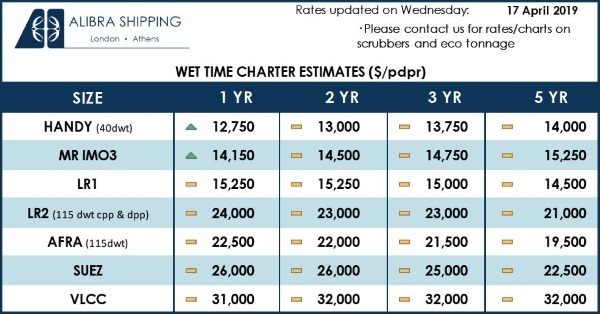 Overall in 2017, the average of the ClarkSea Index, which measures earnings for most of the main vessels in bulk shipping, was 14% higher than last year. As shipping represents in the order of 85% of world trade, we must always remain cautious of geo-political and macro-economic factors. We start 2018, as we did 2017, with lower forward visibility of earnings from a lower forward order book. This reflects both the reduced levels of newbuilding orders and lower period business done in the market in recent times, as highlighted last year. Nevertheless, spot volumes and rates have been improving, which during 2017 more than offset the lower forward order book brought forward, and produced increased revenue across the business. We continue to place great emphasis on ensuring we are the advisors of choice across all of our divisions. This strategy of diversification and being ‘best in class’ in all verticals has served us well and should be a driver for growth as more of our markets see better times. Overall, the broking teams enjoyed a successful year as, generally, market conditions improved. Dry cargo performed significantly better during 2017, with spot earnings reaching the highest level in five years, and following a protracted downturn, the offshore markets started to see some signs of renewed interest following the sustained strengthening of the oil price during the second half. There were also improvements seen in the specialised products and futures markets, with the secondhand sale and purchase team having a particularly strong year. Clarksons Research had another year of strong revenue growth as it continues to establish itself as the market-leading provider of intelligence and data across the shipping, trade, offshore and energy markets. 2017 was a period of focused investment in new products and technologies, which muted profit growth, but will provide an improved platform for the future. Our clients recognise the invaluable contribution that Clarksons’ trusted intelligence can provide in both helping them to set strategy and enabling fast and effective short-term decision-making. The financial division performed strongly during the year. Clarksons Platou Securities completed an increased number of corporate transactions, including high profile activity in the equity and debt capital markets, continued activity in restructurings and a number of M&A transactions. The successful roll out of our metals and mining business during 2017 and the recent addition of a convertible bond team further adds to the extensive services we are able to deliver to our clients. The project finance market has also seen increased activity, particularly in the real estate sector, where our team in Oslo have been both busy and effective, and the dry cargo and container sectors, where clients are looking to benefit from the long awaited upturn. The port services team has had another profitable year, having benefited as the year unfolded from the upturn in activity in the oil and gas industry. The team has continued to expand into new markets and has made several hires, strengthening its offering. As global trade evolves, we recognise the need to constantly innovate and improve to strengthen further our leading position in the sector. During the year, Clarksons has focused particularly on driving digital change, investing in developing digital solutions and pioneering innovative technology to shape the shipping industry and complement our existing business. Whilst it is early days, I am delighted to report increasing adoption of the Clarksons Cloud platform, both internally, where our teams are benefiting hugely from improved information flows and tools to help decision-making and improved connectivity to clients, and externally, where a number of high profile clients have adopted our tools, particularly through our collaboration in launching Recap Manager with the London Tanker Brokers’ Panel, and more generally through our operations platform, Gateway. Despite industry-leading technology investment, in the second half of the year, as announced to the market, Clarksons was subject to a cyber security incident. The team responded rapidly and decisively and whilst the eventual impact on the business was minimal, and at no time was the Clarksons Cloud impacted, we have put in place extensive additional security measures to best prevent a similar incident happening in the future. A leading edge offering across finance, broking, research, support and technology must be delivered by a first class team, and we have continued to invest in the best talent globally as we strive to deliver ‘best in class’ service to all our clients. Our office network has grown further to include offices in Japan and Korea as we continue to supplement our global capabilities with local expert knowledge. In addition, we have made a number of key hires in dry cargo, securities, structured asset finance, futures, port services, IT, data collection and operations. I would like to thank all of our employees for their hard work and dedication to Clarksons’ success during 2017. We are encouraged by the rebalancing of supply and demand we are seeing across the shipping industry, with activity levels picking up across a number of our key markets. The strengthening of the oil price in the second half of 2017 has been particularly beneficial to the offshore markets, whilst our financial teams have also profited from an improved economic outlook in both shipping and offshore. Increasing levels of industrial production and continued infrastructure spend in some of the world’s major economies provide further momentum for growth in the medium-term. Clarksons remains at the forefront of the shipping industry and our investment in cutting edge digital solutions will enable us to offer our clients a unique and innovative platform to support their business needs. Our commitment to providing ‘best in class’ service, combined with our global reach and unrivalled market insights, has enabled us to deliver another year of profitable growth and market share gains and positions us well for the coming year.